We have a lot more power than we think we do. Now’s the time to use it. Money talks. And now, more than ever, the private sector is listening to the collective voice of the LGBT community. In many ways, our dollar is as strong as our votes at the ballot box. We have fought hard to secure our rights in the name of equality, but our true equity and ability to bring about change for our community lies with our economic power. Our buying power and impact on the nation’s gross domestic product have given us tremendous leverage to advance political advocacy and global human rights. 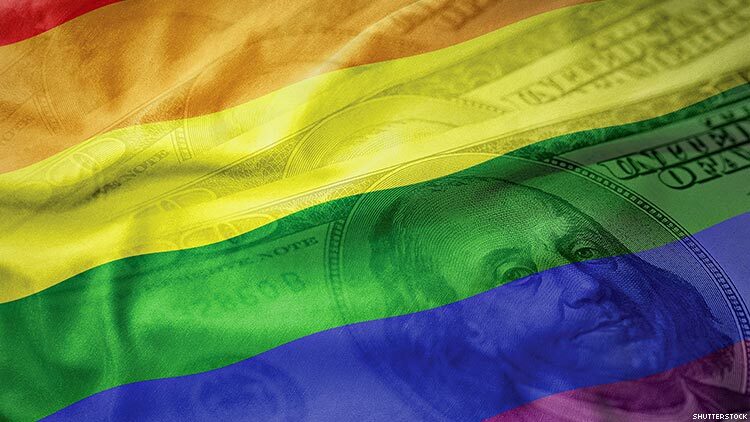 As is true with our social visibility, our economic visibility is essential in building a diverse and inclusive society — and the power of the LGBT dollar is becoming more and more visible every day. That was the impetus for the formation of the National LGBT Chamber of Commerce 15 years ago. In 2002, we realized no one had truly considered the economic equality of LGBT people or the impact economics could have on the equality movement. With over 1.4 million LGBT business owners (and growing) behind us, we have seen the LGBT community earn its place at the table of economic opportunity. Two decades ago, slapping a rainbow on a liquor bottle one month a year was enough for a brand to consider themselves “gay-friendly.” Findings from LGBT economic experts, however, have taught corporations the value of LGBT brand loyalty. More than 75 percent of LGBT adults and their friends, family, and relatives say they would switch to brands that are known to be LGBT friendly. In 2017 alone, the LGBT consumer buying power was over $917 billion. If the total contributed value of the estimated 1.4 million American LGBT business owners is considered, our input to the economy is over $1.7 trillion. That would make LGBT Americans the 10th largest economy in the world. For a little perspective, that’s bigger than the economies of Australia, Canada, and South Korea combined — what a fabulous country! Furthermore, our community’s businesses grow larger and last longer than others in the United States. On average, American small businesses fail around the five-year mark, but NGLCC’s certified LGBT-owned business enterprises average over twice that, with at least 12 years in business. These LGBT-owned businesses are also powerful job creators: 900 LGBT-owned companies we studied created an estimated 33,000 jobs. LGBT entrepreneurs are committed to hiring greater numbers of LGBT employees and ensuring their own supply chains are as diverse as possible. Business leaders in our community continually redefine industries and shatter stereotypes. From techonology firms to local restaurants and retail shops, we are proving every day that if you buy it, an LGBT-owned business can supply it. When you look at a price tag, look for an indication that the company is an LGBT-inclusive corporation or an NGLCC Certified Business Enterprise. It has never been easier to go online or check with your local LGBT chamber of commerce to make sure you support the brands that have our community’s back. If you are an LGBT business owner and not yet certified as one, you’re leaving opportunities on the table to help your business and be counted as part of our LGBT global economy. You could join our ranks as a role model, job creator, and future LGBT business success story. When it comes to diverse communities — LGBT people, women, people of color, people with disabilities, and more — we must stand in solidarity as a business force. We have never seen greater cooperation and solidarity than we have in recent months. And a great deal of that is due to the recognition that LGBT people are also part of every other community. Use the LGBT community’s trillion dollar clout to make a difference. Support your community when you shop, seek out LGBT-owned businesses when you invest, and stand by those who stand with us. The LGBT community is an economic force to be reckoned with — and every one of us plays a part in it. JUSTIN NELSON and CHANCE MITCHELL are cofounders of the National LGBT Chamber of Commerce (NGLCC). NGLCC is the business voice of the LGBT community, the largest global advocacy organization specifically dedicated to expanding economic opportunities and advancements for LGBT people, and the exclusive certifying body for LGBT-owned businesses.